The cross – with you will adorned-is the ultimate symbol of the order. The withe color is the symbol van purity.According to the medieval vestimentary tradition of the knights. The red is the symbol of nobility and readiness for fighting for justice and peace. The four arms symbolize the cardinal virtues: Prudence, Temperance, Justice and Fortitude. 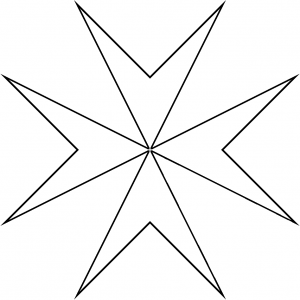 Additionally, the 8 points have special meanings with respect to the knights: loyalty, fidelity, courage, helpfulness to the sick and poor. Contempt for death, honor, generosity, and piety. You shall accept your order governance and its worthy commandments. You shall always defend the humanist values of your order. You shall respect human weakness and constitute yourself its defender. You shall love your country. you shall stand steadfast before your enemy. You shall fight base instincts and strive for the establishment of love in all things. You shall perform your duties faithfully, not contrary to the law of god. You shall bear witness to truth, and shall remain steadfast to your pledged word. You shall be generous, and give with largess to all in need. You shall be always the champion of right and good against injustice and evil.